“Fathers support families financially,” read one placard at a rally a few days before Fathers’ Day. “Fathers teach us family values,” said another. “Fathers tuck us in at night,” reminded one poster that is almost as tall as the young boy that was holding it. Unfortunately, hundreds of thousands of children in the United States will spend Father’s Day today without their fathers. 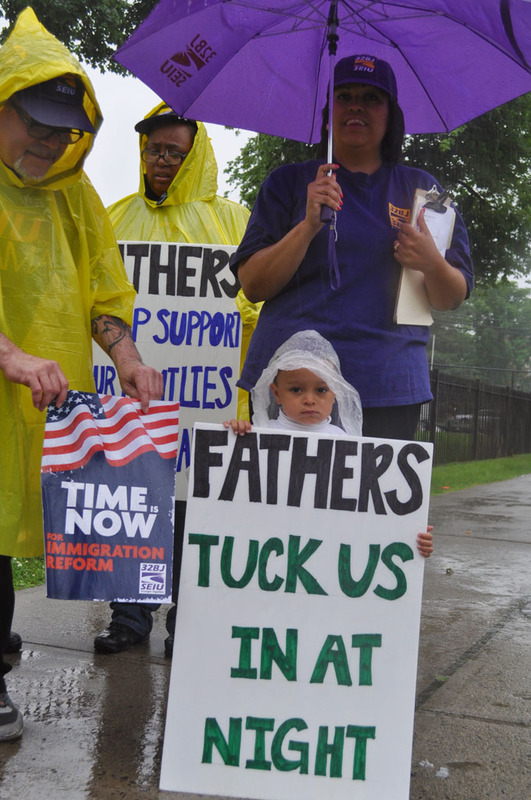 Many of them have been deprived of a father’s love for many years now because their fathers were among those who were detained or deported by the Immigration Customs and Enforcement (ICE). 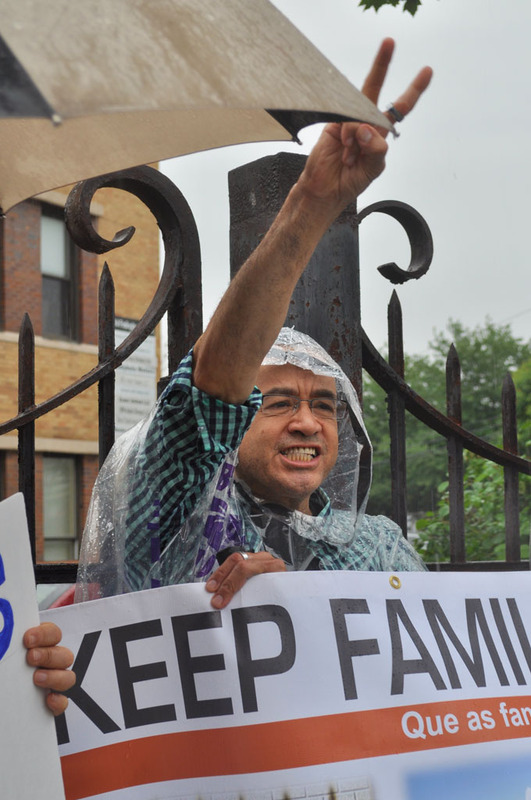 “We want ICE to use the discretion that they are empowered to use,” Fr. 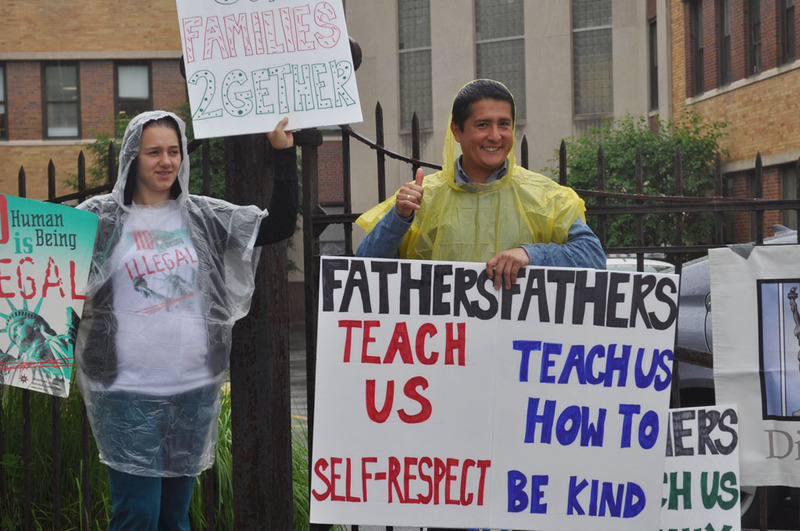 Gene Squeo of Pax Christi NJ said during the “Father’s Day Without Fathers” rally on Thursday in front of the ICE detention center in Newark, NJ. Between 1998 and 2007, more than 100,000 children, mostly U.S. citizens have been separated from a legal-permanent-resident parent who was deported, according to 2011 ICE Report to Congress. From July 1, 2010 to Sept. 31, 2012, almost 23 percent of all deportations — or, 204,810 deportations—were issued for parents with U.S. citizen children, according to federal data unearthed through a Freedom of Information Act request posted by Colorlines.com. ICE has been deporting almost 400,000 immigrants every year or over 1,000 immigrants a day since 2009, most of them family breadwinners. Fr. Squeo said that deporting breadwinners does not only cause emotional trauma to the family left behind. “There are also financial consequences that might become so burdensome and difficult for immigrant families that are torn apart,” he said. In December, the Obama administration announced that ICE will focus more on deporting dangerous criminals and less on minor offenders who pose no threat. Two years earlier than that, ICE director John Morton actually wrote a memo saying that ICE will use its prosecutorial discretion to go after undocumented immigrants with serious criminal records. Fr. Squeo said many advocates for immigrant rights believe that the Obama administration needs to do more in terms of exercising that discretion. Despite the 2010 ICE memo vowing to focus more on dangerous criminals, immigrants arrested on traffic violations were the second biggest group of detainees deported in 2010 and 2011. 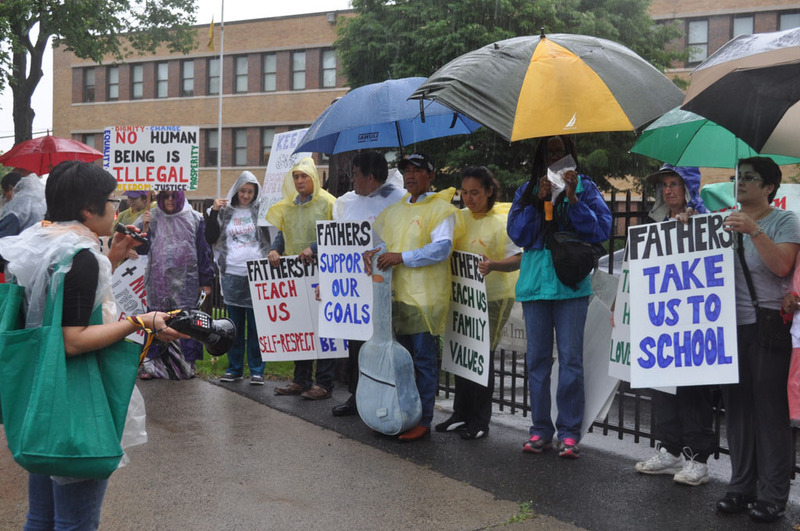 Alix Nguefack of the American Friends Service Committee said during the rally that a friend of hers was arrested and brought to the ICE holding facility in Newark where the protesters gathered that rainy Thursday morning. Fr. Squeo said he is hopeful that the U.S. Congress will be able to pass the immigration reform bill this year. He, however, expressed concern that the final bill may come out too harsh for immigrant families and that it would place an emphasis on border security. “Those who oppose a fair immigration policy will try to poison the bill with very harsh requirements that will make it a real burden for people to take the path to citizenship,” he said. With regards to border security, Fr. Squeo said that he understands that politically, the only way to make comprehensive reform happen is to make border security an important part of the bill. “I hope that members of Congress and the American people don’t lose sight of the fact that if we want border security, it should be by sowing seeds of peace in other countries and by employing fairer trade and economic policies that people from other countries won’t be driven out of the lands they love because of poverty and violence,” he said.